If you’re someone who suffers from hyperpigmentation, whether from sun spots or acne scars, you could probably benefit from a brightening product. 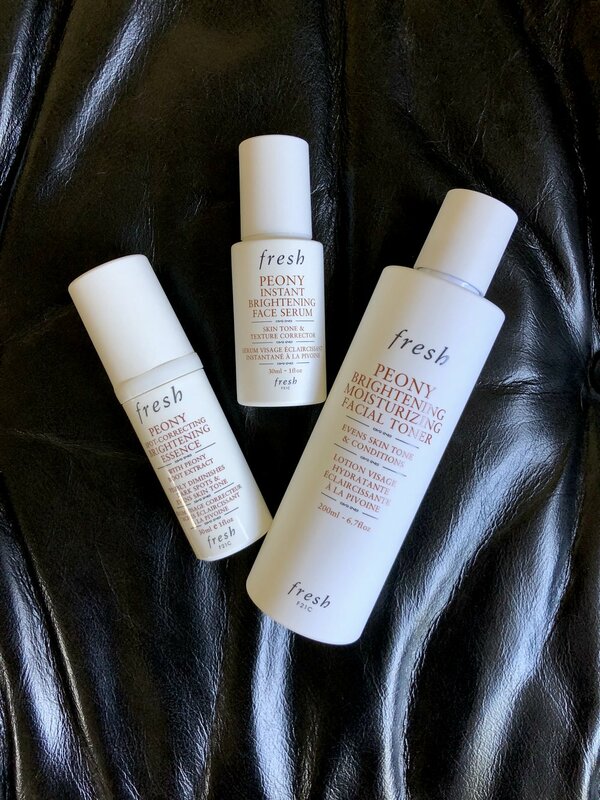 Fresh Beauty has got you covered, with their line of Peony Brightening Products. I’ve been testing these out over the last few months, and I’m happy to report they’ve definitely been helping with any uneven tone or discoloration I have. Three potent ingredients- peony root extract, vitamin C glucoside, and licorice root extract- help reduce the appearance of dark spots while promoting skin clarity, leaving you with bright, luminous skin. Hyaluronic acid adds an intensive moisture factor as well. The Peony Brightening Moisturizing Facial Toner provides 24-hour moisture and keeps your skin baby soft. The silky formula absorbs quickly, priming the complexion for the rest of your skincare routine. The Peony Instant Brightening Face Serum is super smooth, and works to improve uneven skin tone and texture, while also illuminating the skin. I like to apply it to my entire face post-toner, right before moisturizing. The Peony Spot-Correcting Brightening Essence works quite similarly to the serum, but I just think of it as a more concentrated version. It’s perfect for those stubborn dark spots that just won’t seem to go away. I love that these products don’t use extremely harsh ingredients like hydroquinone, but rather stick to natural brightening powerhouses like peony and licorice roots. So much better for your skin, and not to mention your overall health!